High school and college are often said to be the best years of your life – the golden age of youth. But when students are struggling with juggling assignments, clubs, honor societies, athletics and more, they may feel a need to just escape. And that’s where gaming comes in. Video games allow you to immerse yourself in an entirely new world, one where you can choose who you want to be and what exciting new adventures you want to explore. Before you know it, reality melts away and leaves you lost in a place, unlike anything you’ve ever known. The real world will still be there once you turn your game console off, so it’s essential that you learn to manage your time wisely. 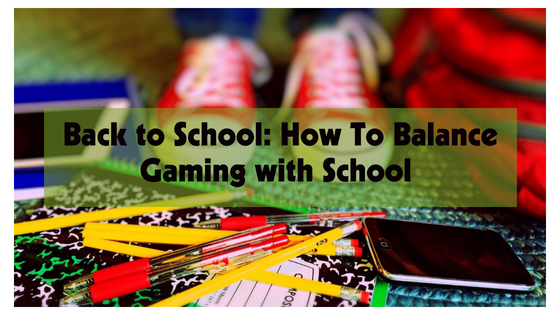 We want to make it easy for you – the team at GameTruck Atlanta is here to show you three ways to balance video games and schoolwork! Procrastination is a bad habit. Sure, it may feel good to relax a bit and put homework off until later – but the added stress you’ll feel once you realize you don’t have time to finish everything you need to do isn’t worth it. Luckily, overcoming procrastination can be as easy as intentionally choosing to do your homework first and saving the fun, as in gaming, for after you’re finished. It’s like dessert. Parents always say to eat vegetables first to get them over with and enjoy dessert later so you don’t spoil your dinner. Getting rid of homework first frees up more time to enjoy fun activities without deadlines looming over you while you play. Even if you don’t keep a planner, it’s a good idea to schedule a specific time for gaming. That way, you get that essential ‘me’ time without cutting into the time you’ve set aside for other tasks. If your homework varies in amount or type every day, try to be flexible with your start time. Your end-time should be the same every day, however. Setting an alarm is one way to remind yourself that you shouldn’t keep playing into the night. Make sure it’s a noise you’ll be able to hear over the sounds of your game. With all of the homework and after-school activities students have, you might find that the only time you have available for gaming is late at night. That’s fine! You need to find time to do things you enjoy – but remember to switch off the console or PC at least 1 hour before going to bed to have a good night’s sleep. Scientists have found that interacting with electronics, and video games in particular, so close to bedtime can harm your vision and prevent successful REM sleep. This can lead to a slew of consequences, including waking up in the middle of the night, nightmares, and being lethargic and exhausted upon waking up. Staying awake during classes is hard enough – why set yourself back even more? Getting tired of the playing the same games every day? Switch things up with GameTruck’s personalized parties! The Atlanta team has 60+ games and all the latest consoles, including XBox One, PlayStation 4 and Nintendo Switch, so you can finally have time to defeat that Bloodborne boss you’ve been fighting for weeks. You can reach GameTruck here or call them at (866) 253-3191.